Our Service Division can handle any job - large or small! We stock a large inventory of parts and equipment to provide quick and efficient service. Supervisors can perform minor repairs such as chlorinator tubing replacement and the installation of minor skimmer parts for which the labor is included in your management contract. Any required parts are an additional cost. In-season work is scheduled as soon as possible with a 24-hour turnaround for most emergency repairs. 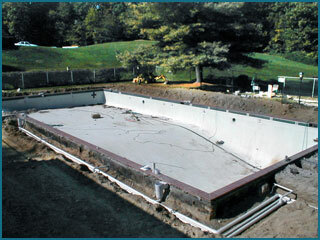 We like to plan renovation and major repair work off-season when we can give you more competitive pricing. Please call at any time for an estimate or price quote, or you may submit your request on-line using the form below.